It’s really hard to properly game when you’re trying to move. Boxed up gaming systems don’t make the process easier, and the lack of free time to really dive into a game makes the hobby a tough thing to take part of. As a way to help pass the time recently as I’ve been packing up and preparing to move, I’ve been playing a few “Freemium” games on my tablet, and thought I’d bring a few to your attention. Since I am doing a “rush,” don’t expect complete reviews, but more like a bunch of snippets. The premise of the game is simple: there is a time/dimensional rift and all of the heroes (and villains) of the series are existing at the same time. You work with Trunks and King Kai to build a group of heroes (and villains) to determine the cause of the distortion and how to fix it before the world it collapses. Gameplay is also simple: you build a team of heroes and move across a board similar to the Budokai games. Fights are handled by selecting Ki Spheres; matching the same color Ki as your character nets more Ki for that character, and the more Ki you collect, the stronger your attack is (as well as having the ability to do a special attack). Each character has a color/attribute, and each of these has a strength and weakness (like TEQ beating AGI). Attacking someone you are strong against deals more damage, and and vice-versa. I’ve been playing this since April 2016, and it’s the game I have the most experience with so far. It’s also the first game I will probably be uninstalling, oddly enough. Why You Should Play It: It’s a Dragon Ball Z game with the usual jokes and characters. You can create a team of characters that span the ENTIRE run of Dragon Ball, from the original series up to Dragon Ball Super, with more coming. Also, unlike some of the Freemium games, you are given a ton of resources for playing; there’s an event every few weeks to give you a good head start on Dragon Stones (the in-game paid-for currency), and there’s almost always a special event to unlock additional high-tier characters (or special ones to purchase). There’s also the fun of mixing and matching characters. Every character has a number of abilities, ranging from a Leader Skill to a “Link Skill.” Link Skills only activate when you are side-by-side with another character that has that same skill, and often have amazing results. For example, certain Goku cards have “Kamehameha” as a Link Skill, so whenever he is side-by-side with another card with the same ability (often another Goku, Gohan, or Goten), and he meets the criteria (activating his Super Attack), the effects of the Link Skill come into play. These can be game changing, and it adds some fun tactics. Why You Shouldn’t Play It: After a while, the game does start to drag. Battles get repetitive, non-event battles become a breeze, and events can get rather frustrating as you need to have a combination of luck and every suggested character in order to complete them. Getting some characters is also a pain. They are random draw, but I wonder how good the randomizer is when I get the SAME 10 characters in a multi-pack for the third time. Literally, identical. There’s also an issue with farming materials; you can run the same level eight times and never get a single one of the materials you need to awaken (i.e. power up) a character. It gets rather frustrating that there isn’t an easier way to get the materials, and it is pretty random. The last kicker, for me, is the lack of versatility. The “best” teams in the game are built around Super Saiyans, and even if you build another team around a specific Link Skill (like the classic characters with “Guided By The Dragon Balls”), you won’t have the same power. It really does detract from the game for me, honestly, and between that and the simplicity at this point, I’ll probably uninstall it soon. This popped up in my feed because a friend of mine was playing it, so I thought I’d take a look as I do like Marvel comics. The premise is an alternate version of the Marvel Universe (Earth-TRN562) in which Nick Fury creates a school to gather and train heroes to fight forces such as Hydra and Aim. Gameplay consists of recruiting heroes to your university via completing tasks, assigning them tasks and assignments (ranging from studying to secret missions), and using the materials gained to progress in some way, whether it’s to level up a character or to unlock something. Why You Should Play It: While it’s similar to so many other freemium, social media games (assign characters and wait), it’s got some perks in production quality. The voices (the few I’ve heard; I’m often playing during breaks or when my wife is trying to sleep) are solid and amusing, and there’s plenty of comedy within the storyline itself (ranging from Firefly references to Stark hounding after women with late-teenager-level pickup lines). It is also a truly casual game, requiring time and nothing else. Added bonus, for me, was the character design and selection. 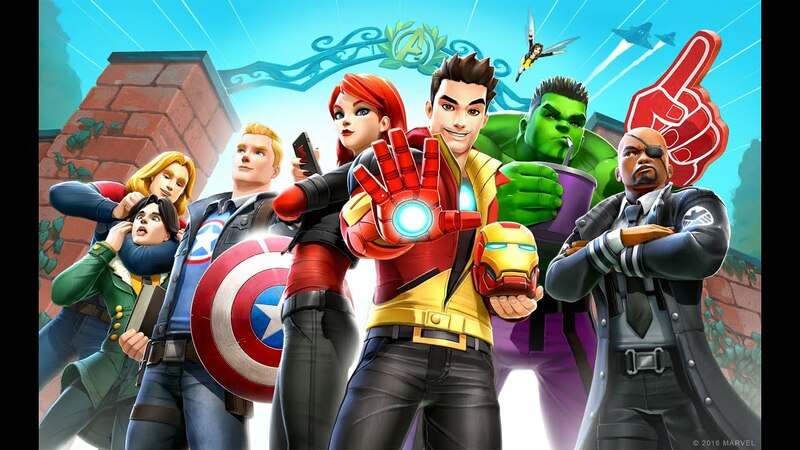 Characters start off dressed mostly casual (Stark’s suit is only partially built when he joins, Wasp is in a sundress, Black Widow wears black jeans and jacket with red shirt, etc), and as you level up, the characters look more like their usual selves (but with some tweaks for this universe). Fun stuff, honestly. There’s also events that occur rather frequently; from what I can tell, there’s an event a month, on average, each giving you the chance to unlock special characters and do even more stuff during the event. It makes it interesting, as it is also tied to the storyline of the main game as well as all of them tying together. Why You Shouldn’t Play It: So much of the game is a cash grab. Most games give in-game currency for things like leveling up, signing in often, or any other number of reasons. Not so here. You gain a few Infinity Shards when you level up the Academy (I think I’ve gotten about 5 each time), but they are a pittance when alternative costumes for your characters are 200+ each, and characters themselves cost upward of 1000 shards. Shards are, for the most part, used to either speed up the game (getting tasks done) or getting new decorations/characters, but with the high cost of things, you really are going to pay out of pocket to get your favorite characters or looks. If you aren’t patient and want everything NOW, don’t bother playing it. You’ll burn through way too much money far too fast, especially since each character will run you about $10, give or take (and nearly $30 if you are getting a character early). The game isn’t exactly played, but is long-term allocation of resources. While the animations are nice (with some bugs), it’s not that much fun to watch after a while (and 8hr missions can drag, obviously). Final note: it seems some of the extra characters you get don’t get as many missions. I unlocked Squirrel Girl with the most recent event (missed my chance at M.O.D.O.K. due to being too new and not wanting to spend a ton of money), and I haven’t gotten her for a non-special mission yet (and her special missions require plenty of buildup of materials). Kind of lame to have a character that does nothing around the campus. After all of the fiascos with mobile Final Fantasy games, I didn’t think I’d even look at this one until a friend of mine suggested it and praised it in such a way I couldn’t say no. Really, the selling points he gave were “It has a story like classic Final Fantasy games” followed by “You actually get to explore dungeons!” With that, I had to check it out. Why You Should Play It: If you are nostalgic for an older-style Final Fantasy (SNES era), you should look into it. It’s got graphics you’d expect from the newer sprite-based games, with the same feel of the classic Final Fantasy games of the early-to-mid-90s. The story itself is also a throwback; big bad wants to destroy the crystals for his nefarious reasons and will stop at nothing until he succeeds, but your heroes have been chosen by the crystals and granted a special power to stop him. How much more classic JRPG can you get? The game has a number of characters spanning the entire Final Fantasy line, including Final Fantasy Tactics (which I didn’t expect; still trying to get a character from that game, as it is arguably my favourite of them all). One added perk: you get to explore cities AND dungeons, so you aren’t just hitting a button to go off and fight; you can make your explorations count, and you can get bonuses for exploring. Quests in-town range from “Go fight these things” (meaning energy expenditure) to “Go find this person in town for me.” Again, classic JRPG antics. Also, if you get annoyed with the lack of specific characters: you get “increased rate” events for specific characters. Granted, they aren’t guaranteed, but I know a few people have had good luck with them getting the character they want (I swear, if I get another Penelo, I may scream). Like most other Freemium games, you get bonuses for logging in. Each month has bonuses, so if you log in daily for a month, you’ll get progressively better stuff. Win-win there! Added bonus for logging in: there’s are dungeons you can unlock daily, and each of them give you some sort of bonus for completing, whether it’s gil, character XP, or materials. Why You Shouldn’t Play It: Story-wise, the game revolves around your main character, but you never need to use him after the first couple of fights. Honestly, I got a really awesome Red Mage on a lucky draw thanks to a bonus summoning ticket, and he’s been my leader ever since, completely removing the need of the main character, Rain. The game also has some major grind elements. Leveling up is typical Final Fantasy fashion (fight stuff, gain XP, level up), but you also need to grain XP for your own Rank (better rank, more NRG, more exploring you can do), gil (which isn’t much unless you do the daily), and materials. Materials, depending on the type, are used to forge items (weapons, armor, and healing. . .as long as you have the recipes) or Awaken characters. As item drops from daily dungeons are entirely random, you could be running the daily Awakening Dungeon dozens of times and never get a single character Awakened. As per protocol with these games, there’s no guarantee to get anything, and that includes materials. You can pay all you want to hopefully get a character, but you aren’t promised to get what you need to Awaken them, and that doesn’t factor in IF that character can be Awakened. This is a downer for a Final Fantasy game, that’s for sure, especially since there are limits to how much you can accrue before having to pay for it, leading to the next point: the Cash-Grab. The in-game currency is Lapis. You get tons of it in theory, but considering you use it not only for energy recovery and summoning, but also for increasing your storage space of ALL varieties; equipment, characters, materials, and healing items all have a 50 limit, and it gets pricey to raise each of these (about a level-up worth of Lapis for 5 slots). Another Marvel game is on the list, but really, I snagged it because it’s Puzzle Quest, which is always a hoot. Sure, it’s a generic Match-3 with a twist, but can you really go wrong? Why You Should Play It: It’s Puzzle Quest, simple as that. You choose a battle, select your party, and then go to town to defeat the enemy. If you like Marvel characters, specifically the comic variants (as every character comes as a “cover,” which is pulled right from the comic designs), and you enjoy Puzzle Quest, then it’s a no-brainer: go download it. The game also includes a number of challenges built in to keep it going. We see Lightning Rounds every so often (short-time events for prizes), limited time events (often inspired by the comics, such as a variant world in which Osborne runs H.A.M.M.E.R. post-Civil War, but Captain America is Peggy Carter) for specific (and sometimes random) prizes, and Deadpool Dailies that have set requirements in order to be completed (and some of them make the game challenging). Fun thing: you get bonuses for daily logins, but you MUST complete a level (and actually finish it, not fail) if you want to gain your login bonus. Why You Shouldn’t Play It: One of the biggest problems I ran into was the slow start. As you are playing the game, you’ll want to get more characters. Characters are all random draw, and will require tokens (unlocked by playing or log-in bonuses) or Hero Points (paid currency; can be earned by playing) to unlock the better characters. In order to level up the characters, you’ll need to get additional covers of that same character but with different powers (all have 2-3 powers), then you can level them up after you unlock the powers. You also need a rather large number of Hero Points in order to unlock spaces in your Roster, which where you store your characters. It’s possible to not pay anything and play, but you WILL be limited as you will fill your roster rather quickly with characters that get bonuses for events that you don’t want to get rid of “just in case” they are a required character for an event/Deadpool Daily or a character that’ll get a massive boost for a specific event. Really, don’t play this game if you aren’t patient or easily frustrated. You’ll be spending more time than expected waiting for characters to heal (or getting first aid kits) and have to grind a bit to get the necessary currency to either raise levels or expand your collection. The idea of Freemium games is interesting, but it gets rather frustrating. I personally miss the days of paying a set price for a complete game (plus whatever extra for true expansions, like we saw with StarCraft and StarCraft: Brood War), and then not having to pay anything else to play the game. Now, we’re seeing games with little to no cost to start, but then EVERYTHING has a price. Sure, it’s nice seeing the ongoing support, but when playing the game involves ads saying “Buy this thing that will help you”, it detracts from it a great deal in my book. I’ll play a few on my tablet to help pass the time, but I don’t think I’ll be really following up on them too much. Things are currently in the air, so I’m not sure what is next. By the time this post goes live, I should be unpacking in my new home or still cleaning/fixing up the old one before turning the keys in. As the new place has some. . .odd situations, I need to get my ISP to re-wire the internet service to the house, as well as get my office set up (which means adding new outlets so I don’t fry the computer or burn the house down; yay pre-1970’s wiring!). Gaming of all stripes will be on hold until some time after Labor Day if all goes well, so please be patient with me and I’ll be back with some fun stuff as soon as I can start playing, reviewing, and building!